There are few things worse than heading out to the garage in the morning in order to start the day only to find that the garage door isn’t working properly. And unfortunately this is all too common a problem that affects people not just throughout the U.S., but throughout the world as well. The good news is that there is no need to raise the home’s alert level to DEFCON 1, nor is there usually a need to call in an expensive professional. In fact, by troubleshooting the problem, many homeowners find that most garage door issues can be fixed in just a few minutes, even if they aren’t exactly natural handymen. So in the interests of solving irksome garage door peccadillos without breaking the bank, here are some troubleshooting tips anyone can follow. This may seem like a no-brainer, but it is crucial that homeowners be thorough when inspecting their garage door systems for visible damage. That means not just looking at the tracks and rollers, but looking at the hinges and checking for loose mounting screws as well. Any loose screws should be immediately tightened, and any faulty hinges should be immediately replaced. As for tracks and rollers, any dents or crimping in the metal can oftentimes be banged out with a small hammer. If this doesn’t do the trick, then total track replacement may be in order. The owner should put the garage door in the closed position for this task if that is possible. It’s a good idea to then start by inspecting all brackets and making sure they are held firmly in place with lag screws. Next, use a level to ensure the tracks are flush with one another. Then use a measuring tape to ensure that all elements of the portion of the opener mounted to the ceiling are hanging at the same distance from the ceiling. Look to the System Itself. It’s no use pretending that modern opener systems aren’t complex, because this just isn’t true. That said, homeowners can remedy a number of system issues without tinkering too much with the system itself. 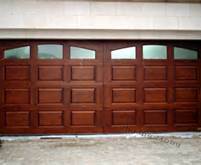 For example, most modern garage-door systems have sensors mounted to either side of the door. If homeowners are experiencing issues wherein the door isn’t opening all the way – or it only opens slightly before lowering again – then the issue likely has to do with these sensors. The simple fix for this is to inspect the sensors for any obstructions or dirt on the lenses. It’s not uncommon for the very thin electrical wires that connect the sensors to become loose in the normal course of moving people and stuff in and out of your garage. Also, owners can inspect the motor, as often the small lever that controls the door’s movement becomes stuck. By following the above advice, homeowners should be able to solve the majority of common garage door issues on their own. That said, anything that requires an overhaul of the whole electronics system — or working with the springs — should be left to the pros, as these tasks are usually not just difficult, but dangerous as well. Tommy Mello owns www.garagedoornation.com, a website specializing in wholesale garage parts. He enjoys sharing garage improvement ideas and maintenance tips. Should You Buy The Same Spring That Is Currently On Your Garage Door?